The city of Miami Gardens covers an area of approximately 20 miles and is located between the midway between Fort Lauderdale and Miami. In the 1960’s, residents of nearby neighborhoods began to migrate to the area now known as Miami Gardens. Currently, it is a collection of neighborhoods that were annexed into the city starting in 2003. It is a family-friendly city with the average age of its resident slightly under 36 years old. It is best known for its sports and entertainment facilities, which include the Calder Race Track and Dolphin Stadium. Easily accessible from the Turnpike, Palmetto Expressway, and I-95, Miami Gardens experiences a considerable amount of traffic from its resident commuting to work, commuters from neighboring cities passing through on the highways, or visitors to their sports centers, Miami Gardens experiences a high level of traffic congestion throughout the day. The city of Miami Gardens is located near the major highways of the Palmetto Expressway, I-95, and Miami Gardens Drive. The city experiences high volumes of traffic each day, thus increasing the risk of car crashes for its residents. Car crashes that occur on major highways can cause significant injury and property damage, due to the high travelling speeds of the vehicles involved. Injuries can be extensive and may not allow the victim to work during the recovery period. Many times, accident victims are unaware that they are entitled to compensation if the accident was not their fault or they attempt to settle the case on their own, accepting the first offer made by the insurance company. Ultimately, accident victims do not receive what they are entitled to and may experience financial and emotional hardship if they are unable to pay for medical bills and continue treatment. If you have been the victim of a car accident and have questions about your options, contact the Miami Gardens auto accident lawyers at the Wolfson Law Firm at 305-285-1115 for a free consultation. Distracted driving is an ever-increasing epidemic throughout the nation. Motorists breaking their concentration on the road can lead to car accidents that cause injuries that may result in death. According to the Department of Motor Vehicles, nine people are killed every day in distracted driver car crashes in the United States. Distracted driving is most commonly associated with cell phone or text messaging while operating a vehicle. However, distracted driving can result from seemingly ordinary circumstances, such as talking to a passengers or children in the car. The National Highway Traffic Safety Administration categorizes driver distractions into three categories: visual, manual, and cognitive. Visual distractions includes activities that take a driver’s concentration off of the road. Reading text messages, checking the navigation system, or changing a radio station can temporarily remove the driver’s eyes from the road. Sadly, it takes only 3 seconds after a driver has diverted their eyes for an accident to occur. Manual distractions involve a driver removing one or both hands from the steering wheel. Reaching for a cell phone, eating or drinking while driving, or sending a text message encourage drivers require the use of at least one hand. Cognitive distractions are those that take the driver’s mind off of driving. Being lost in thought, daydreaming, or talking on the phone or to those in the car cause a driver to lose focus while operating their car. 62% of automobile accidents that are attributed to distract driving occur due to the cognitive distractions. 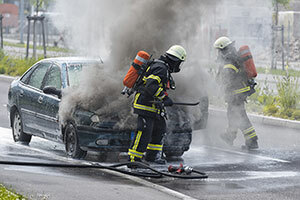 If you have been the victim of a car accident, contact the Miami Gardens auto accident lawyers at the Wolfson Law Firm at 305-285-1115 for a free consultation. How Can Our Miami Gardens Car Crash Attorneys Serve You? The Wolfson Law Firm proudly serves clients in Miami Gardens and its surrounding community. If or someone that you love has been injured in a car accident that was the result of a distracted driver, contact the attorneys at the Wolfson Law Firm at 305-285-1115 for a free consultation. We can help you and your family to get back on the path of recovery.